The sound comes through out of the nothingness. A rustling of leaves at first, then the clattering of long, slim sticks of bamboo, and, finally, the groaning creaks, like a weathered wooden ship, of thick old trunks slowly shaken awake by wind. At the end of the narrow roadway, tightly held by dense forests of trees and bamboo, the reception house of Amanfayun emerges. There is little to announce it. In only a 20 minutes drive from the city-scraper line of Hangzhou, the 21st century appears, at first, to have been left behind. Nestled beneath North Peak, much of what shaped the century-old dwellings of villagers who tended the tea fields that still terrace up the mountainsides remains unchanged. This is, of course, what the Aman Resorts group do best. Rather than re-modelling a setting, their resorts nurture the best of what has been and what still is in a way that allows you to experience the essence of a culture and location. This has gained them a collection of resort-hopping followers affectionately known as 'Amanjunkies' and Amanfayun is newly adding to their trail. Here, stone paving flags the pathways between the low, pagoda pitches of jin-clay roofs, carved screen-shuttered windows and white-wash walls. Inside the main reception area - Fayun Place - formed from the seamless linking of two former village courtyard houses, beams and struts of dark, untreated timber line the ceiling and walls. Tables and chairs carved into simple shapes of unbleached timber - almost Shaker style - sit lightly on the stone-paved floors. In another area, a rectangle alcove is a corner of comfort with long, low cream cushioned sofas running around its rim. Hanging above all, the rectangle box-lanterns, covered with humbly carved screens glow, softly sensual. ..the images on walls are the flat and fine strokes of CALLIGRAPHY, interiors are coloured only with barely-there neutrals and the muted GOLDS of lanterns. The interiors of 42 rooms, suites and villas inhabit this same self-effacing chic. Modesty gets left behind in quiet ways, the most apparent of which is size. The smallest accommodation here are the 16 village rooms which begin at around 710 square feet (66 square metres) ranging up to the largest of Amanfayun Villa, a 3122 square feet (290 square metres) residence with two king-size bedrooms, a reading room, lounge, dining and massage room spread across two levels. All bathrooms have twin vanities shaped like shallow clay bowls. Rather than white ceramic baths, there are wood-clad tubs - big, deep and perfect for timeless soaking. The stone-paved floors are warmed with underfloor heating but much effort seems to have gone into giving you freedom from today's distractions. Yes, if you must, there is unlimited Internet, but television and iPods have been kept as available-on-request items. Instead of hits of in-suite excitement, the images on walls are the flat and fine strokes of calligraphy, interiors are coloured only with barely-there neutrals and the muted golds of lanterns. Rather than seeming less, somehow out of this calm something more materialises. The colour-hit at this resort is the green of forests and fields and it appears newly intense and alive. At dusk, a walk to the West Lake, arced by evergreens, allows you to watch the colours of day devolve in a range of purple hues to nothingness before the night sky lights up with a great wash of stars. The main restaurant displays the most elaborate architecture. A stone-carved entrance feature wall and walkway are flanked with expanses of water features. Ceiling-high windows receive a contemporary screening of long, timber struts. Perhaps fittingly, the food here serves up western flavours. Authentic regional Chinese can be found in the more traditional setting of Hangzhou House restaurant which serves dishes such as Beggar's Chicken and West Lake Snow Shrimp Cooked With Tea Leaves. There is also a Steam House restaurant which serves home-made dumplings in a casual indoor/outdoor setting. While The Luxury Travel Bible was born with a heat-seeking radar for spas, it had extra reason to smile inwardly, if not pause, when it found that the spa at Amanfayun consisted of five separate buildings set amid groves of bamboo and tea bushes and, most delightfully, that the separate tai chi, yoga and meditation room was adjacent to a wall of Yongfu Si - the Buddhist Temple of Goodness. There are a couple of places where you can sneak away to undo some of the wellness - a cigar lounge is on the second floor of Fayun Place, and a bar stretches above the main restaurant - but the Tea House which serves the best regional teas, including the finest of all greens, Longjing (Dragon Well) Tea, will no doubt pull you back on track. From there, you can walk to any of the five historic Buddhist temples nearby. Their glorious explosion of reds, golds and saffron offer a whole otherworldly fix. 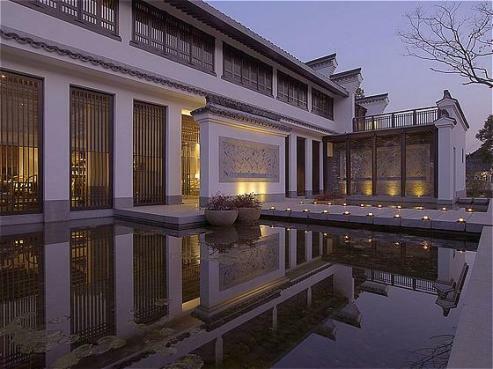 Check in: Amanfayun Resort, 22 Fayung Nong, Xijujedao Xihugenfjingmingsheng District, Hangzhou, PRC310013. Tel: +(86)571 8732 9999. Ultimate Luxury: All the quiet neutrals and natural textures that make up your suite - most soothing for noisy minds. The Chinese massage and circular wooden soaking tub in the spa bath house don't go astray either. Most Indulgent Moment: Walking up the mountain to the Temple of Taoguangguanhai and staring down into the valley and lake below. The Little Things: When you have a spa treatment they take your shoes and return them to you polished. Junior Luxies: Most accommodation is set for couples and unless they're good at sitting still and keeping quiet, perhaps not. Dress code: Keep it neutral and flowing in organic textures - linen, silk and cotton. Leave brights to the saffron-robe monks. Forget heels and keep shoes sensible for cobbled pavement and forest walks. Perfect luggage: Canvas duffle in chocolate, caramel or cream.